As part three of our exclusive design series we explore the importance of choosing the right exterior finish for your covered outdoor space. The exterior finish of this screened porch matches the existing home to a T.
I know that your screened porch inside is what you see on a regular basis. 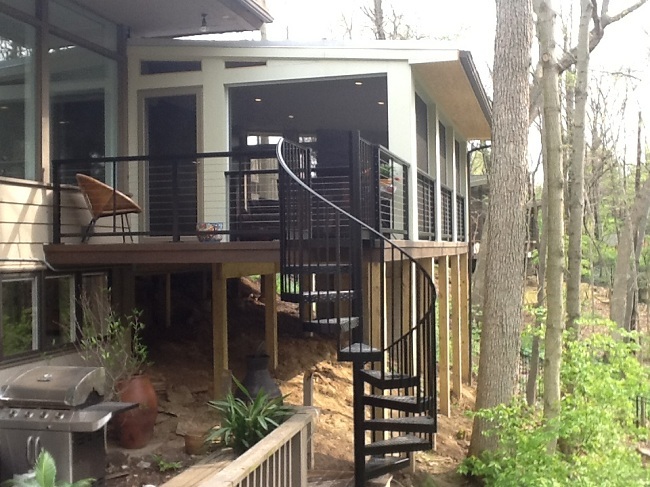 With that in mind, the exterior of your screened porch effects the view of your home as a whole. Our goal on each project we design is to create a space that looks and feels original to your home. This screened porch exterior is finished in stucco in the same color and texture as the house and looks original to the existing home. How do our designs make it all come together? The first step is to take cues from your existing home. A good option is to have the exterior of your space stained or painted to match the color of your home. We can also match the fascia, trim, soffit and gutters to your homes existing hues. 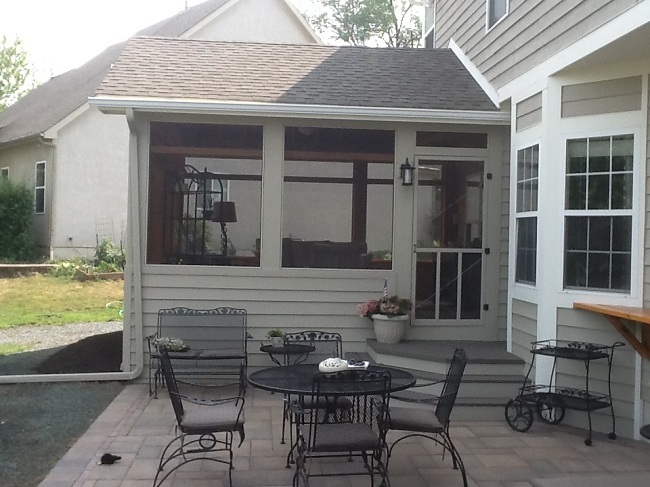 The columns on this screened porch are painted to match the existing home. Sometimes we try to match the colors used on your screen porch door to those of the windows and doors of your home. A good example of choosing a veneer which will tie your structure into your existing home from a design standpoint is through the knee wall portion of your porch. A knee wall runs the perimeter of your exterior space. Even a small scale knee wall takes up an area from 18 to 36 inches and can be a key area of your exterior finish focus. If your home is stucco, we would recommend finishing the knee wall with the same stucco on the outside finish. This is the same with a home that is vinyl, hardy plank or even brick, using the same materials as your home’s exterior on your knee wall will make the exterior cohesive with the exterior of your home. With brick and stone veneers sometimes it is difficult to get an exact match because specific colors of stone and brick are often discontinued. If this is the case we can match it to as close to the native veneer of your home as possible. 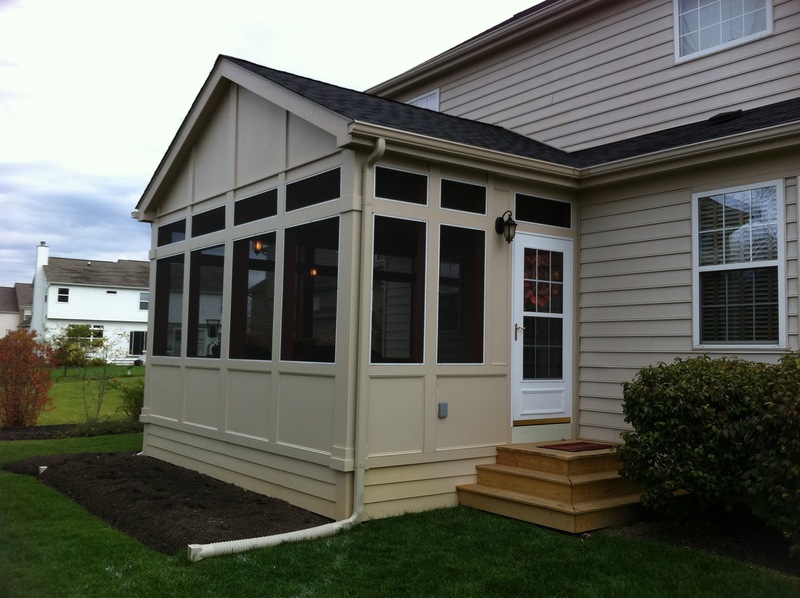 This Columbus gable roof screened porch is a perfect example of a close end, finished design that adds continuity to the style of the porch and existing home. Many homeowners are choosing to go with low-maintenance exterior finishes by using vinyl and PVC products on the trim, roof posts and roof beams. These elements offer ultra-convenience. 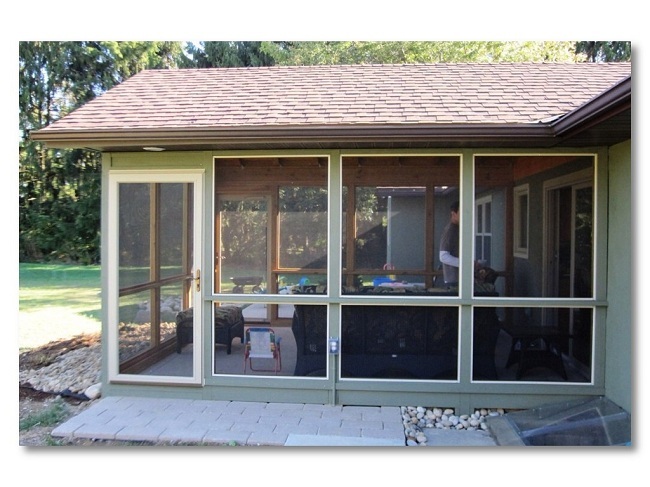 Even small areas can be matched to keep the colors cohesive such as the aluminum framed screen inserts used in screen porch construction. If your home’s windows are trimmed in white we can special order the screen inserts in white as well. Colors aren’t the only way to create a covered porch or screened porch that delivers a design in keeping with your home and architecture details. Taking advantage of shape, such as creating screen porch openings which match the shape of your home’s windows is another good way to pick up elements filled with originality and pulling them into your outdoor space. On a gable or gable-end roof design you may choose to keep this area open and screened or closed ended and finished to match the cues set forth through your home. It is all up to you. This contemporary style screened porch looks original to the house because the exterior is finished in the same style as the home. From color to roof style the space looks like it has always been there. 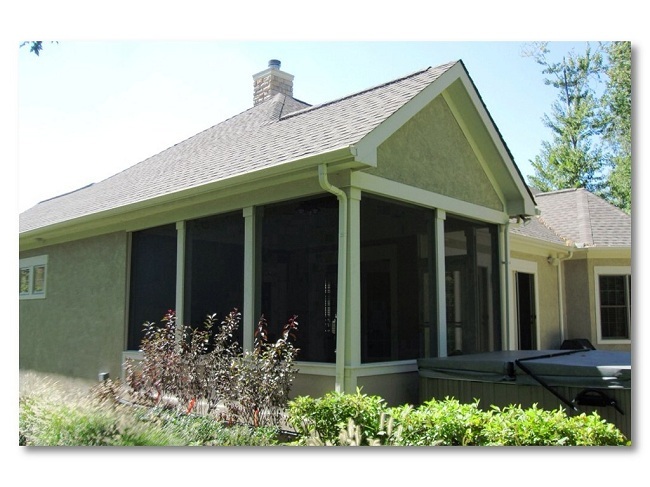 This exterior was painted to match the adjacent home, even down to the screened openings. Another viable option for keeping the originality of your design in focus is to compliment your homes color and architecture as opposed to replicating an exact match on the entire exterior. This can be achieved by adding new design elements such as fluted columns with extra trim which can be wrapped and finished in a complimentary color of your choice. With screen porches many homeowners like to go with a rustic, vintage cabin style design in all wood tones. Choosing a unique exterior for your screen porch design can add character and charm to your home, and many homeowners just don’t want everything to match. These one of a kind exterior finishes turn out wonderfully. 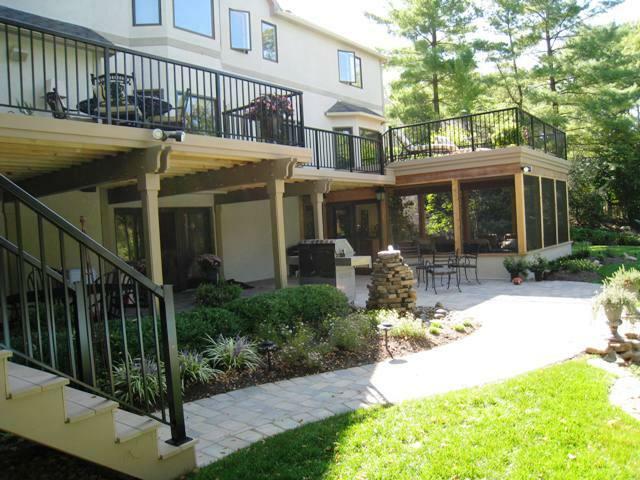 This outdoor living combination includes a screened porch, twin decks and a stunning hardscape patio. 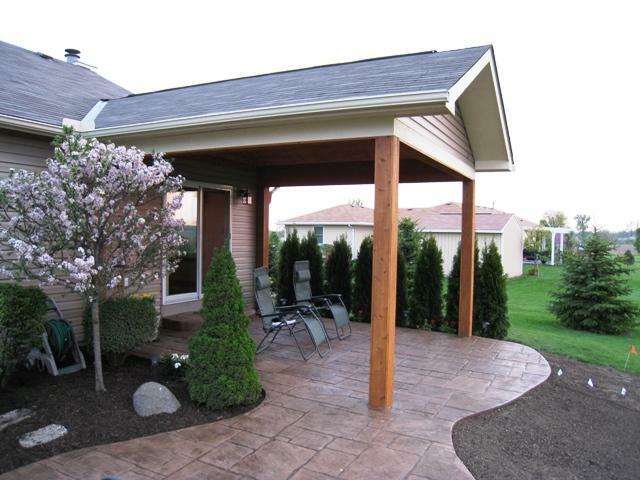 Notice how the exterior finish compliments the entire backyard and the home. While most of the screened porches we build are attached to the home, we build a small number of freestanding or detached porches. A good example would be a covered patio, or screened room that doubles as a poolside retreat. In these cases there is not as much need to match your home perfectly. We can pull out important elements to compliment your home and introduce new details in as well. Outdoor spaces such as these offer more design freedom than those that are in close proximity to your home in a side-by-side attached construction. Look closely at how the siding on the gable end of this covered porch matches that of the existing house. Our goal is to deliver a space that delivers aesthetic and structural harmony by using compatible design elements. You never want your space to stick out like a sore thumb. You want a space to boost the appeal of your home and landscape and unify your surroundings. 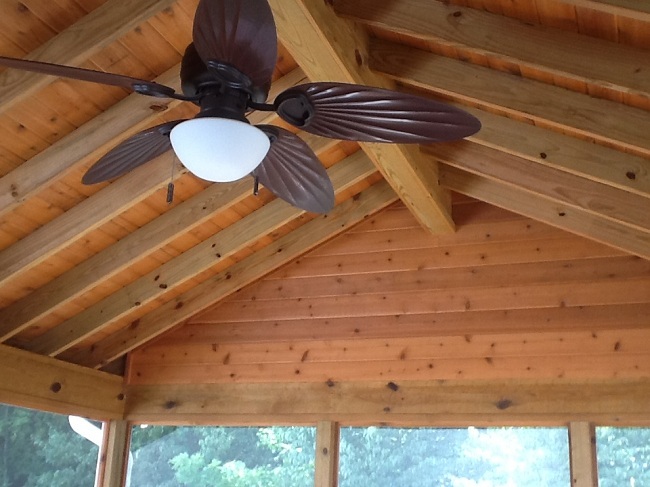 You can see more inspiring covered porch and screen porch designs by visiting our covered porch and screen porch galleries located on our website.